With so many choices and configurations available, how should you go about selecting the correct controller for your application? From modular PLCs that evolved from the room-filling computer racks of old - to micro PLCs that now occupy the same space as original relay replacement bricks and everything in between, there is much for the system designer to ponder when it comes to specifying a PLC system. Add to the equation such alternatives as C-based controllers or a combined PLC/HMI and the choice obviously wide ranging. Get it wrong, and you could end up either with a system that is under-specified – compromising system performance in the short term and needing a costly upgrade in the longer term – or over-specified and so ending up with endless unused features and more cost than the project really justified. Using these tips for PLC specification, you can ensure that you get the right controller every time, tailored to meet the exact requirements of the application and delivering the maximum return on investment. The start point in specifying any controller is assessing your I/O requirements. So-called micro PLCs can offer astonishing performance in lower I/O count systems but hardware, memory or other constraints mean that 300 I/O really does represent the upper limit of their capability. At the other extreme, large modular PLCs are capable of handling tens of thousands of I/O. Between these two extremes sits the compact modular PLC, a recent development that offers combinations of I/O counts and function sets that can be tailored to the application. Combining familiar programming with numerous advanced options, for many mid-range applications they will offer users the ideal solution. Hardware cost has given way to programming time as the most significant cost in system development. The ability to develop highly functional systems in a minimum amount of time demands a high level of flexibility within both the hardware and the software. Using a PLC that comes with a programming environment that is very fast to program and therefore reduces engineering development time, can justify buying a quality brand even when price is crucial. System designers are well advised to look for combinations where they can move seamlessly between different programming languages - either within a single project, or from one project to the next - and where the programming tools will allow them to design and pre-commission a project before going to site, saving costly commissioning time. The best PLC programming tools now include powerful prewritten function blocks, which offer further savings by significantly reducing your development time. The next question to address is the performance capability of the PLC in relation to the application. A packaging machine, for example, will almost always require a high-speed processor, frequently with motion control and connectivity options. However, don't dismiss the performance requirements of something like a temperature control process; it might require the ability to control or monitor numerous analogue I/O and perhaps have maths and PID control as part of its instruction set. The best modern PLCs can work at sub-nano second speed per instruction, calling into question the need for PC-based controllers which would previously have been regarded as the benchmark for high-speed applications. Historically many PLC systems were set up as standalone systems and this may still be appropriate, perhaps for reasons of cost or security. But even the smallest systems can benefit from improved connectivity: remote access can ease maintenance and provide monitoring flexibility, while the ability to gather data from the system can help users to maximise efficiencies and reduce downtime. It is prudent, then, to properly assess connectivity requirements. 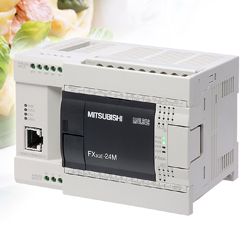 Today, even compact PLCs can deliver maximum flexibility by offering connectivity to the widest number of network protocols – both open and proprietary. Cyber security has become one of today's key concerns. Connecting PLC systems to the internet is an important feature for monitoring and control but does expose these systems to potential cyber attack. At the same time, there has been a notable rise in instances of PLC code being cloned for unauthorised reuse. So question your PLC suppliers on how robust their security is, both within the programming tools and within the PLC itself. Following these five tips, system designers will be able to avoid the major pitfalls in configuring PLC systems, enabling you to specify controllers that will meet all of the application requirements, perhaps with room for ongoing evolution but without the costs of over-specification. If you are still unsure about the specification or type of PLC you need, don't hesitate to get in touch with LC Automation. Our Field Sales Engineers or Technical Support Engineers will be able to discuss your application and help to ensure you get the very best solution for your requirements. Give us a call on 01254 685900 or e-mail sales@lca.co.uk and we will provide all the help and support you need.